Things have not always been easy for Amina. She left school at 14 and did casual work as a house girl and then she started selling at the market buying daily stock from a broker who set the price, and so she made little profit. When she was given a grant 6 months ago things began to change. Our Area Coordinator visited her in January 2017. Amina has a tiny stall on the roadside outside Mbuyuni market, the main market in Moshi, for which she pays the government rent of 200/- a day. This is a good site as it is in the Matajiri (place of the rich people). From the Mondo training she has learnt how to arrange her stock, she has set up a table and some boxes, covered it with a cloth to form a narrow but well stocked ‘take away’ stall and she does well from the ‘drive by’ trade. Her stock includes mangoes (local and from Kenya), oranges, apples (from South Africa), bananas as well as the staples of potatoes, carrots and tomatoes; her prices are competitive and, of course, negotiable. She has many regular customers who no doubt benefit from discounts, many are school children going home after a day at school and she finds herself selling 50 apples a day. 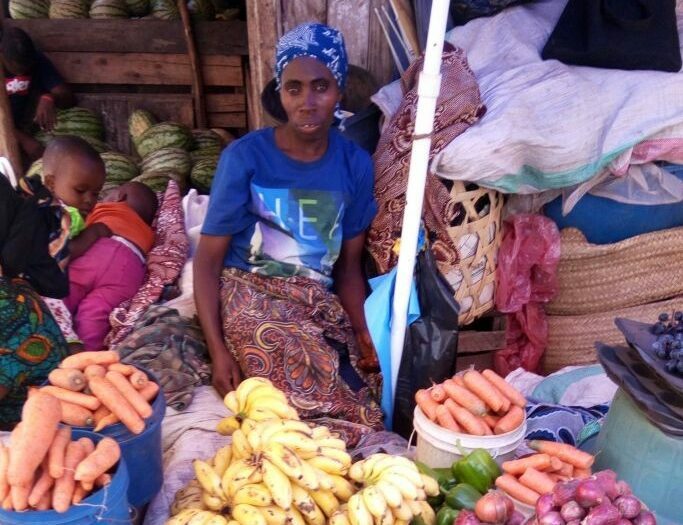 She does a brisk trade but is still looking to expand her business and has her eye on a larger roadside site rather than moving into the inside of the market where bigger stalls/shops are being rented at 100,000/- per month. Amina works hard for a living, she is in Moshi by 5am every morning to buy fresh stock from the wholesalers who have their trucks arriving brimming with produce. She has her stall organised between 6am to 7am in order to sell fruit to the children on their way to school. She works until she has sold as much of her stock as she can which usually means she can start home between 6pm and 7pm. She lives in Pasua a good walk from the market, when she feels tired she is able to take a piki piki (motorbike taxi) home for 1,000/- or she can squeeze into a dalla dalla (small minibus) for 500/-. She works 6 and a half days a week, Sunday afternoon the market closes after a busy morning. Home is 1 room in a safe place surrounded by nice neighbours in Pasua. Amina’s sister lives nearby and helps Amina with the business when she is not well enough to work. At home Amina has three children, Yusuf who is 11, Standard 5 in primary school, Hassan who is 8 in Standard 2 and little Shadia, 4, who is in Nursery. The children are looked after by Amina’s sister when they return from school until Amina gets home. Life is organised and she works long hours but is happy with her recent success. If you would like to help support more women like Amina, we are currently raising funds for our next round of grants and loans. To help us achieve our target you can donate here.